Students from SUNY-ESF will be taking over Groovy Green next week. Get the perspective of the future environmental leaders of America (and places beyond). Come back and see us next week, starting Thursday 11/18/10 and see what they have to say. 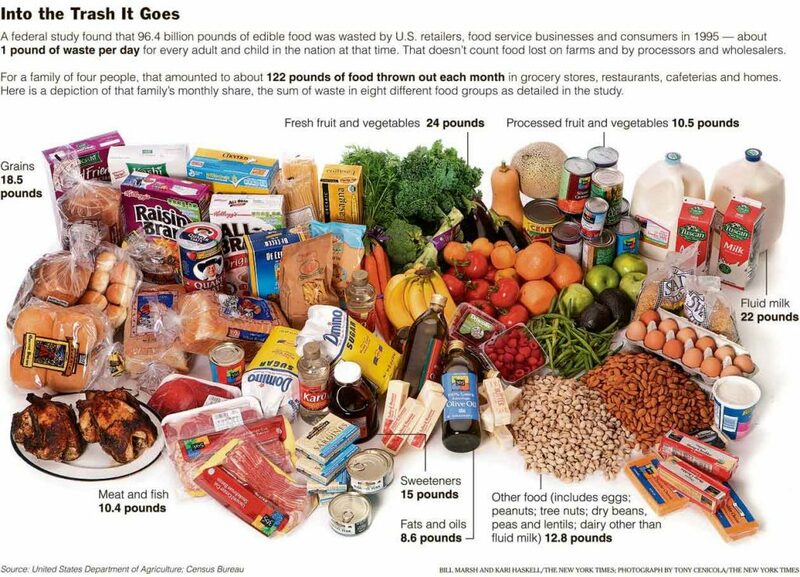 How Much Food Does The Average American Family Throw Away Each Month? 122 lbs. That’s how much enters the waste stream each month from the average American home (family of four). Ridiculous, sad, and incredible at the same time, isn’t it? A study conducted in 1995 estimated that 96.4 billion pounds of edible food was wasted each year — not to mention all of that probably went straight into the landfill. Imagine the recycled compost that could be generated from that! The fascinating graphical representation of our monthly waste, as created by the NY Times, is shown below. Click on it to be taken to a much higher res, readable version. If you’re looking for another way to lessen your impact on the environment might I recommend not buying bottled water; especially bottled water from Fiji. I’ve got to say this one goes in the common sense category. First of all think about how much pollution a trip like that takes. Secondly, who pays $3.00 for a liter and a half of drinking water? Lastly how many Americans don’t have running water and drinking glasses in their homes and offices? Don’t like the taste or purity of what’s coming out of your tap?Buy a filter. Don’t be a sucker and fall for yet another of corporate America’s clever pieces of propaganda.